Collotheca coronetta coronetta, crop of the above image. 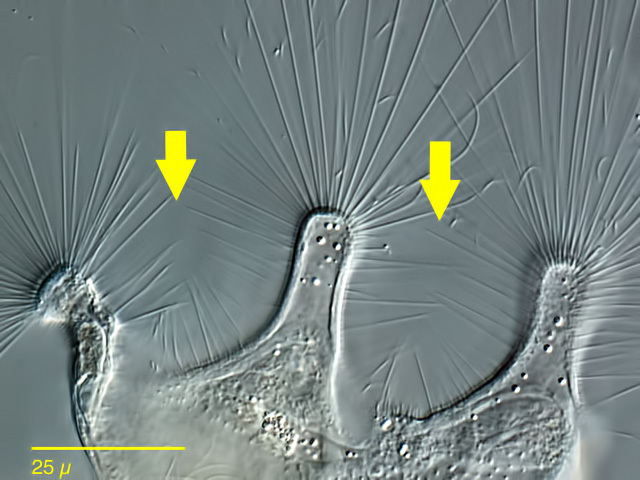 The arrowheads point to straight immobile cilia/ cirri, possibly with sensory function, while the arrow points to motile cilia which may transport the prey towards the infundibulum. 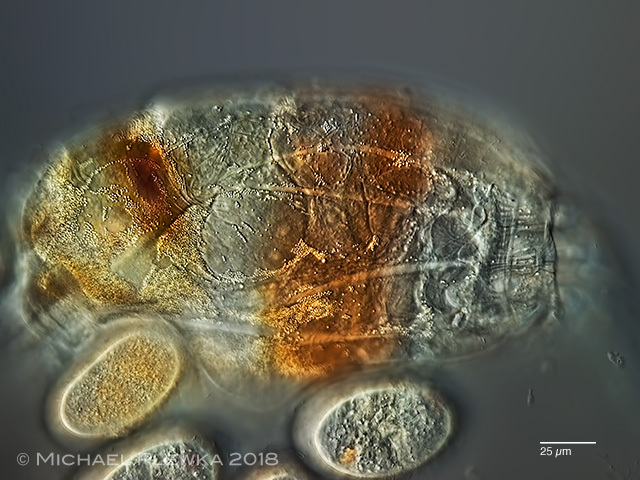 Collotheca coronetta coronetta, another specimen from the same sample (2); optical longitudinal transect of the anterior part. The ciliaf marked by the arrowheads show that this specimen is C. coronetta coronetta. Visible is the dorsal antenna (DA); the arrow points to the eyespot. BV: pharynx/ buccal velum (part of); I: infundibulum; ML: mastax lumen/ proventriculus; SC: sensory cilia/ cirri; V: vestibulum. 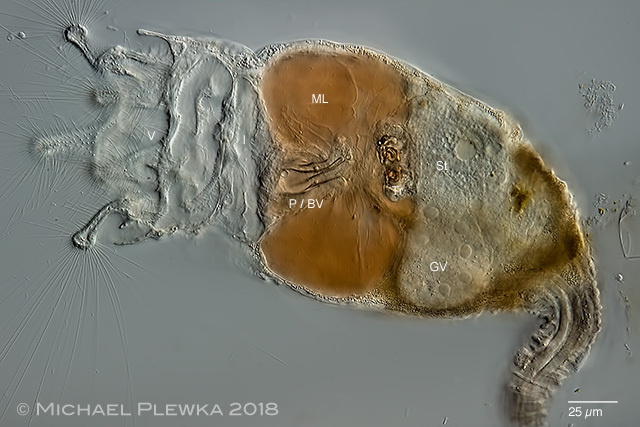 Collotheca coronetta coronetta, another specimen from the same sample (2); the course of prey goes from left to right. Here, the pharynx or the undulating membrane of the pharynx (P / BV) can be seen more clearly. 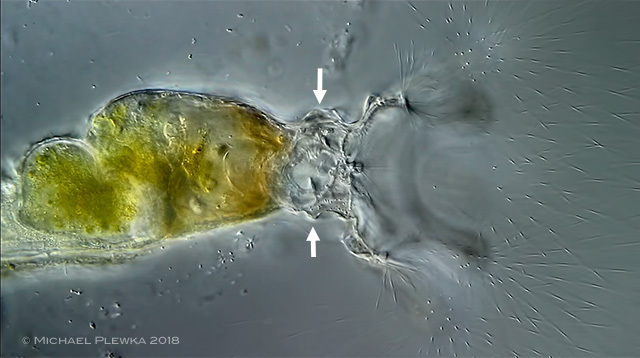 The reddish-brown coloration of the liquid content of the mastax lumen suggests that there is already a pre-digestion or (at least microscopically visible) immobilization of moving prey organisms. 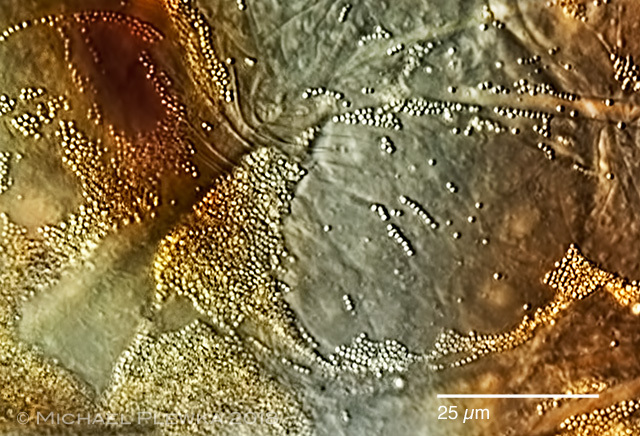 At the end of the proventriculus/mastax lumen (i.e., right) are the hard parts (trophi) with the muscles. 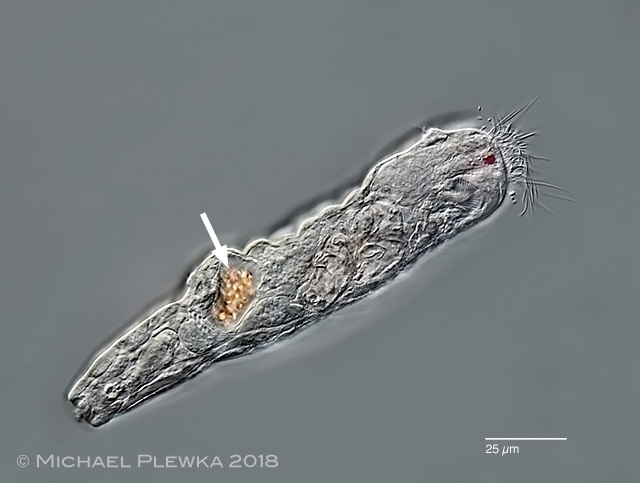 There, the food is either minced, which works for example on prey organisms with "soft" cell wall (e.g., euglenoid flagellates), or only that part of the prey organisms is carried further to the right in the actual stomach (St), which really fits through, e.g. 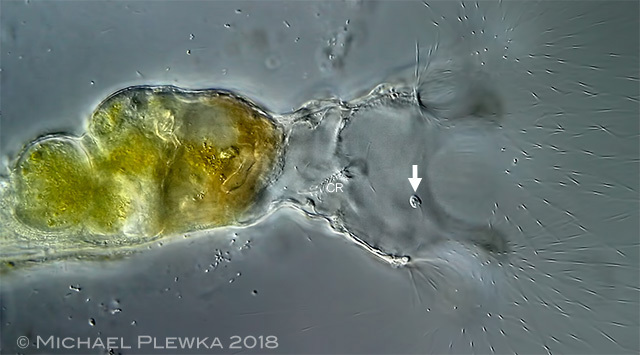 in prey organisms with a silicious cell wall (diatoms) only the lipid droplets are passed through and the cell walls are deposited in the mastax lumen. See Collotheca edenta as example. GV: germovetellarium; P/BV: pharynx with buccal velum; St: stomach; Tr: trophi. 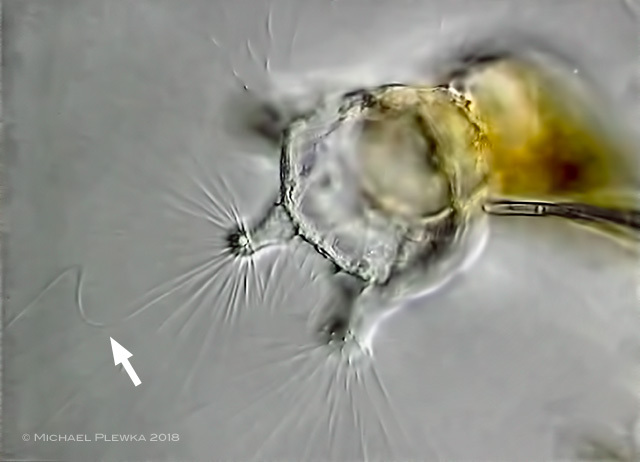 A heterotrophic flagellate is actively moving its scourge into and around Collotheca's mouth / drogue. 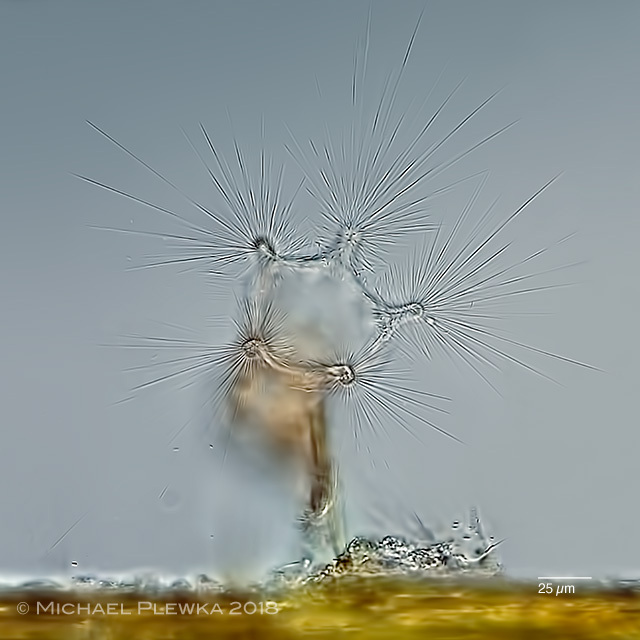 Sporadically, movements of the short cilia between the praise can be observed for fractions of a second. 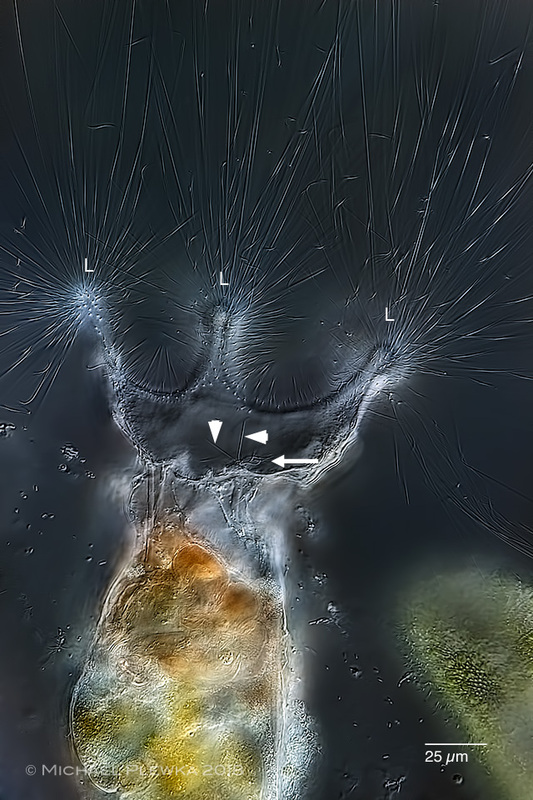 The moving cilia on the papillae at the base of the vestibulum are in constant motion. The flagellate moves back and forth in the vestibulum, briefly out again. 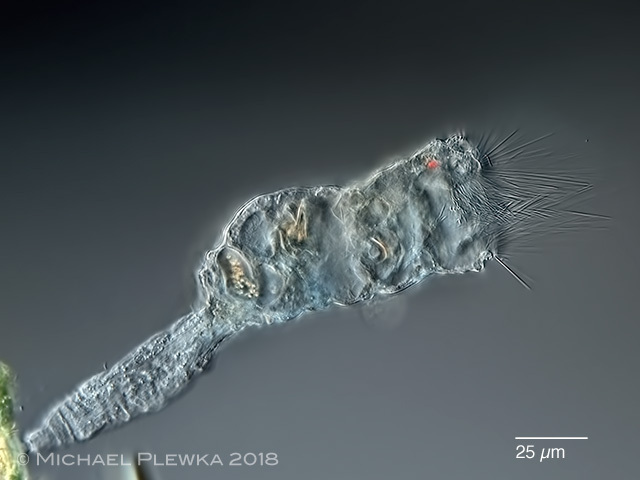 After a few seconds, it moves into the infundibulum, while the cilia row (CR)are constantly moving (so it can be assumed that these cilia at least support the transport of the prey..
Collotheca's body then contracts in the area of ? ?the vestibule, so that the diameter of the animal at this point is smaller (no shortening in the longitudinal axis! 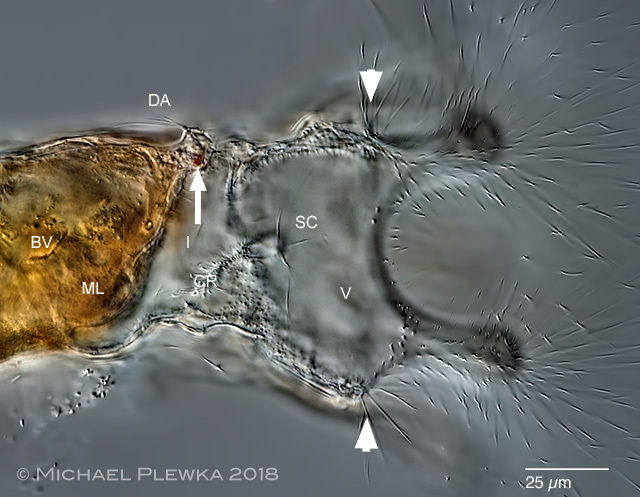 ), The pharyngeal area is quickly pushed forward and the flagellate is constantly moving the pharynx / undulating membrane in the Mastax lumen / Proventriculus transports. 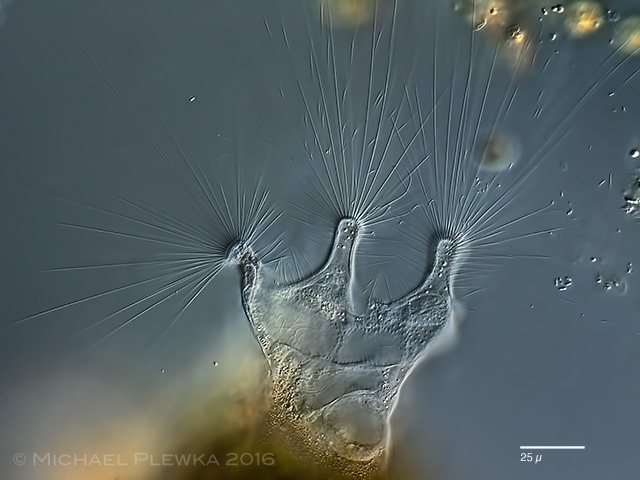 The long cilia on the lobes do not change. 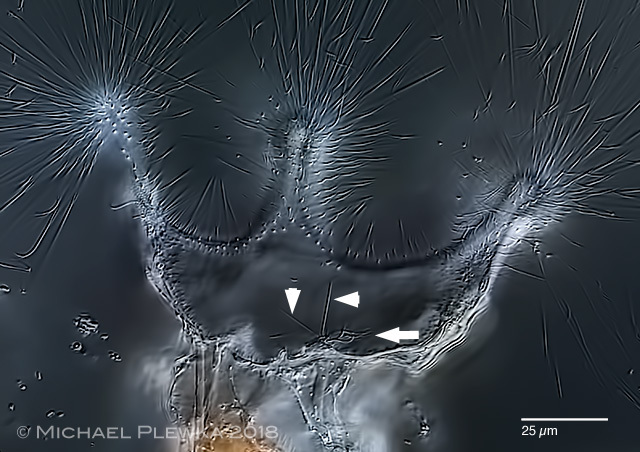 Visible is the undulating membrane of the pharynx (arrowsheads) as well as the uptaken flagellate (arrow). The prey in the mastax lumen / proventriculus is constantly moved by the movement of the pharynx back and forth. 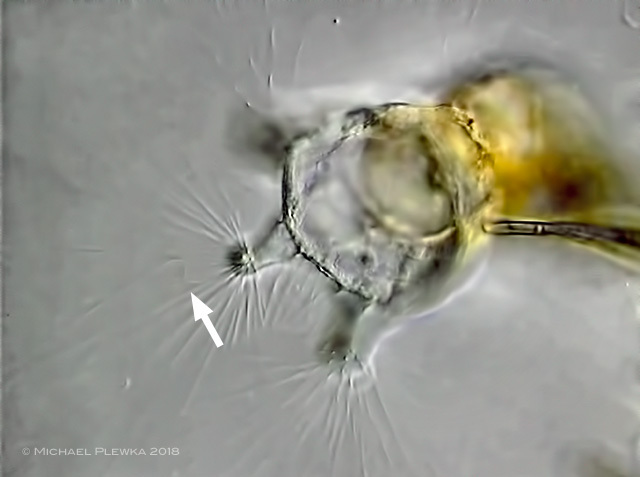 (Not seen in this video, but I've often seen elsewhere - flagellates in particular - the beating of the flagella for a few minutes in the mastax lumen / proventriculus or the metabol movement before the movement ceases). 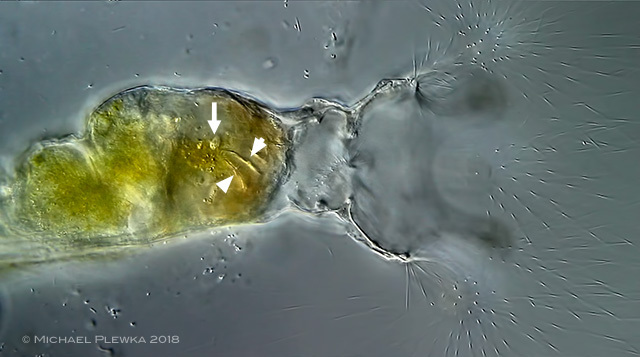 Conclusion: in this species Collotheca coronetta, the long cilia have contributed to this entire "prey catching" in no apparent way; the function as trap is not detectable. As already indicated: also also in the case of C. dentata the prey actively moves into the vestibulum. 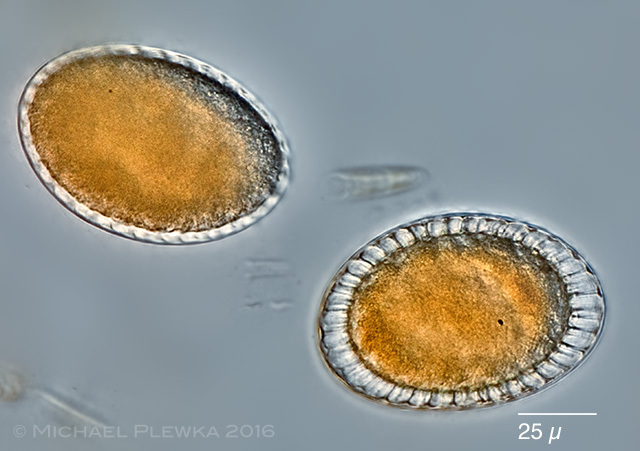 Collotheca coronetta, juvenile specimen, swimming. The intestinum seems to be filled with light refracting granules (aroow) which may serve as energy source. 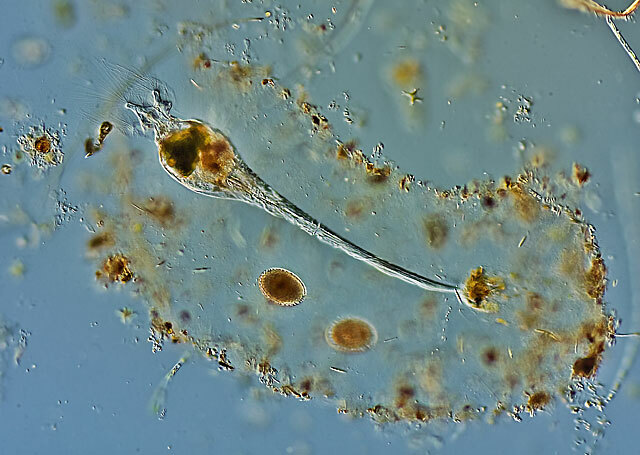 Collotheca coronetta, juvenile specimen, 12 hours later, already attached to the substrate (alga). 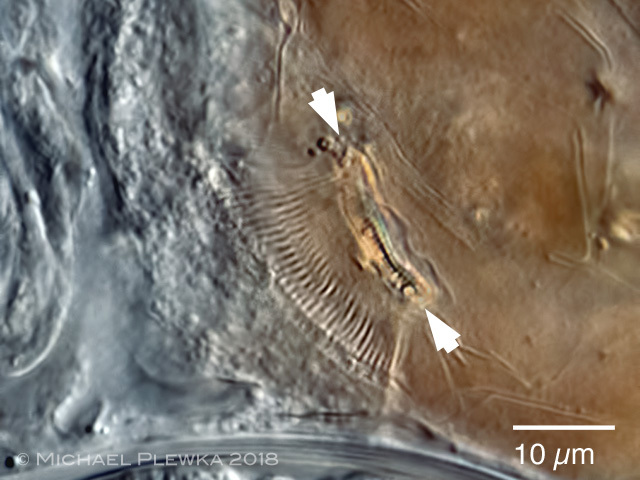 The light refracting bodies in the intestinum are still visible. Location: NSG Heiliges Meer, near Erdfallsee (1); Mariaveen near Griendsveen/ NL, pond with Utricularia sp. (2).